GRAND RAPIDS March 11, 2016– On Thursday, March 17, there will be a day of activities in Grand Rapids honoring the legacy of United Farm Workers founder César E. Chávez. 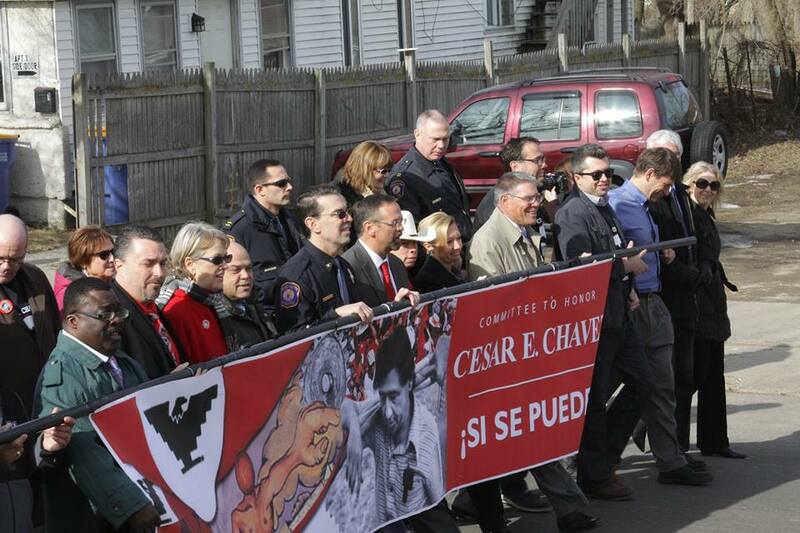 Starting the day off at 11am will be the César E. Chávez Social Justice March. The march will begin at The Potters House School at the corner of Grandville SW and Van Raalte Dr SW and head north to the Edge Urban Fellowship, 735 Ritzema Ct SW. Following the march, at 11:30am, there will be a community gathering at the Edge Urban Fellowship, featuring Pastor “PE” Troy Evans. State Board of Education member Kathleen Straus will be honored for her many years of dedicated service to education in the state of Michigan. Finally, there will be a unity luncheon at Maya Mexican Grill, 1020 28th St SW in Wyoming. Tickets for the luncheon are $25, or $250 for a table of 10. WHERE: A march starts at the corner of Grandville SW and Van Raalte Dr SW in Grand Rapids. A community gathering will take place at Edge Urban Fellowship, 735 Ritzema CT SW. A unity luncheon will take place at Maya Mexican Grill, 1020 28th St SW in Wyoming. Info: Contact Lupe Ramos-Montigny at cesarchavezunitycommittee@gmail.com. This entry was posted on March 11, 2016 by WMALC in Events and tagged Cesar Chavez, Edge Urban Fellowship, education, United Farm Workers.